A cop discovers that there's something unusual about his new partner in this unusual sci-fi thriller. A seemingly well-mannered stock broker one day snaps, robbing a bank, stealing a Ferrari, and driving straight into a police barricade without any thought for his own safety, and he's mowed down by a hail of bullets. 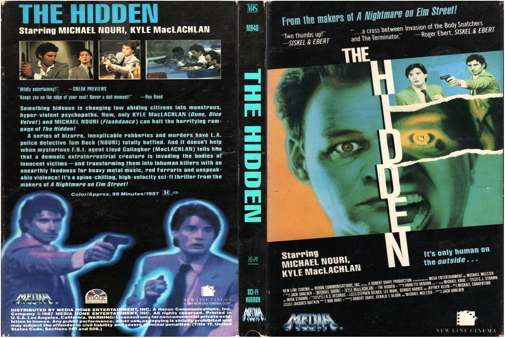 The detective assigned to the case, Tom Beck (Michael Nouri), thinks that he notices a strange look in the eye of the thief, but when FBI agent Lloyd Gallagher (Kyle MacLachlan) informs Tom that he's also been assigned to the case, he thinks that he sees the same curious look in Lloyd's eyes as well. Lloyd also has an odd way of carrying himself, as if he's not entirely in control of his own body, and in time, Tom discovers what the two men have in common -- both are actually aliens from another planet. They are creatures from another world capable of entering a human (or animal) body at will and using it as a vessel as long as they need. When the stockbroker died, the rogue alien simply crept into another body to begin his crime spree all over again. Lloyd has been sent to Earth to bring the thief's reign of terror to a halt and has taken over the body of an FBI agent with that in mind.